If you regularly replace variables or words with M-% or C-M-% — well, you can retire that workflow now, as iedit will handle it for you. Sure, go ahead; use the older way if you have complex, partial replacements you want to do, but if you’re renaming a variable in a buffer… Why not use iedit? So iedit’s pretty great and all that, but I don’t replace words across a whole buffer very often; sure, I hear you say: “just narrow-to-defun with C-x n d!” Indeed, narrowing’s great, but this blog is all about half-baked, half-inventions and cobbled-together scripts, and this post is no exception! I prefer a workflow that minimizes the use of commands to do routine tasks – a fairly common goal for most Emacs hackers. 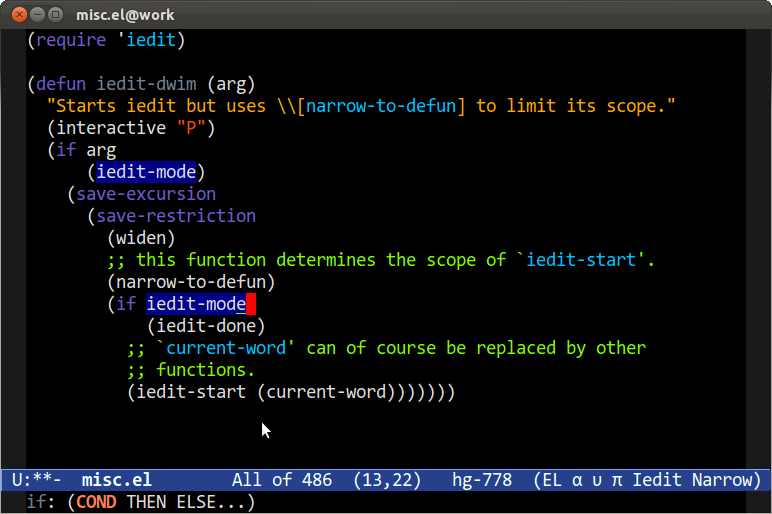 The code below aim to do just that: when invoked, it will take the word at point and only iedit occurrences in the local defun (Note: don’t forget that although defun is Lisp-speak, most modes automatically support commands like mark-defun or narrow-to-defun.) If you pass an argument to the function, it will iedit all occurrences in the entire buffer. The iedit author suggest that you bind iedit-mode – the default command for entering iedit – to C-; and I agree: it’s rarely used and easy to type. Update:Le Wang pointed out that I was using an older version of iedit; the code has been updated to reflect the API changes. I've been using mark-multiple to achieve this effect. mark-multiple has been superseded by multiple-cursors.el (same author). Interesting library. I'll have to play around with it too. From RTFM I can see you have to explicitly place marks where you want it to edit, no? If so, iedit does serve a niche not easily filled by multiple-cursors in that it blithely picks the word under point. mc/mark-next-like-this will mark the next text matching the region. mc/mark-all-like-this will mark all occurrences that match the region. Multiple-cursors is nice cause you can either select next occurrence of region or all occurrences. Then you have multiple cursors at the regions. Then you can do anything you want with the cursors. Victor Ren's repo is at https://github.com/victorhge/iedit . You've linked to a 2 year old version of it and the last commit was 23 days ago. Your Emacs interface looks cool. What's the color theme and font you use? Thanks a lot and nice style, btw. Thanks! I had tried multiple-cursors.el but it didn't work nicely with my other customizations, so I was very happy to hear about iedit, which works well for me. *Region is replaced by that character. narrow-to-region worked well interactively. Tried to modify your defun to work on a region; not having much luck. "Starts iedit but uses \\[narrow-to-region] to limit its scope." Don't think you can do it by marking a region. You have to use narrow-to-region (C-x n n) or just use my handy little helper. What color theme are you using on that screenshot? Very nice. No color theme; never used them. This is my own scheme I've tweaked over the years. I've been using multiple-cursors for some time now and it's fantastic, you can select some occurrences of a word or all and even more. You should check out the recent iedit changes. Symbol selection, rectangles, restricting after selectiing. Sorry for off-topic, but what colour theme do you use? No color theme; never used them. This is my own scheme I’ve tweaked over the years. Never mind the previous comment, I was reading from the Google Reader feed, which had the old copy of the article. It seems like you have already fixed the link. iedit is good. but you iedit-dwim is such a awesome tool. your color themes is so beautiful, what is it? From your .emacs / customize section? I'd be happy to turn your color selection into an Emacs 24 theme for you. > iedit is a lot dumber as it cannot infer context beyond I want to iedit all occurrences of word point is on. > with digit prefix argument 0, only occurrences in current function are matched. This is good for renaming refactoring in programming. That's hardly context beyond what is offered by narrowing to defun. The word "context" means that it can tell the difference between "iediting" a variable called "foobar" and a method also named "foobar". With the standard iedit bindings you can now type C-0 C-; to match only within a defun.